KARACHI - Handing over two pusher tugs on Tuesday, Karachi Shipyard & Engineering Works (KS&EW) is all set to deliver to Pakistan Navy the 4th F-22 P Frigate PNS ASLAT next month. Also, the KS&EW is constructing for Navy a fast attack missile craft and a 32-ton tug expected to be handed over as per contract schedule. The Navy has also signed a contract with KS&EW for construction of a 15000-ton capacity fleet tanker. Tuesday saw the KS&EW formally handing over two pusher tugs to Pakistan Navy in a ceremony held here at the Karachi Shipyard with Vice Chief of Naval Staff Vice Admiral Muhammad Shafiq present as a chief guest on the occasion. Addition of these tugs in the Navy fleet is considered to be an important milestone achieved towards self reliance. Addressing the ceremony, Admiral Muhammad Shafiq said while Pakistan’s geographical location and geo-strategic environment essentially necessitated building of a strong and balanced Navy to defend the country’s maritime interests; realisation of the country’s force goals through foreign acquisitions only was becoming increasingly difficult. The changing geo-political dynamics also suggest that access to the foreign defence technologies, particularly in the high end domains, would be either denied or hard to come by in the coming years, said the chief guest. Accordingly, self reliance has been at the forefront of policies, and it is in this context, Pakistan Navy had been supporting and interacting closely with the local defence industries, particularly Karachi Shipyard, to make a steady progress towards indigenization. Appreciating the efforts of Karachi Shipyard, the Admiral said Karachi Shipyard had delivered up to Navy’s expectations and had been a major support to PN fleet for new constructions, as well as, for repair of the ships. Karachi Shipyard also deserved acclaim for its revival and unprecedented progress during testing times when the global shipping industry as a whole was on the declines, he said. It was well poised to manifest its potential of undertaking major shipbuilding and engineering projects for the country and also for the foreign clients to earn and save valuable foreign exchange. Recent award of contract for construction of 15000-ton capacity fleet tanker by PN was manifestation of the same. He assured of all out support of Pakistan Navy to KS&EW for its revitalization so that all future growth plans were timely materialised. Earlier, Rear Admiral Syed Hasan Nasir Shah, Managing Director KS&EW, gave a brief account of the progress of Karachi Shipyard and underlined the projects being undertaken for Pakistan Navy. He said presently KS&EW was undertaking construction of five vessels for Navy. He apprised the 4th F-22 P Frigate PNS ASLAT has successfully completed all harbor and sea trials and would be handed over to PN in April this year. In addition, a Fast Attack Missile Craft and a 32-ton Tug are also under construction which would be handed over to PN as per the contractual schedule. The ceremony was attended by a large number of PN officers, engineers and technicians of Karachi Shipyard. The design, drawing and kit of material for the two pusher tugs had been supplied by the Damen Shipyards of Holland. Which fac is being built? A third azmat class ship perhaps? The next batch needs better SAMs...then the original 4 need refitt. KARACHI: Pakistan’s Prime Minister Nawaz Sharif has participated in induction ceremony of ‘PNS Aslat’, a multi-mission conventionally-powered frigate, in Karachi on Tuesday. 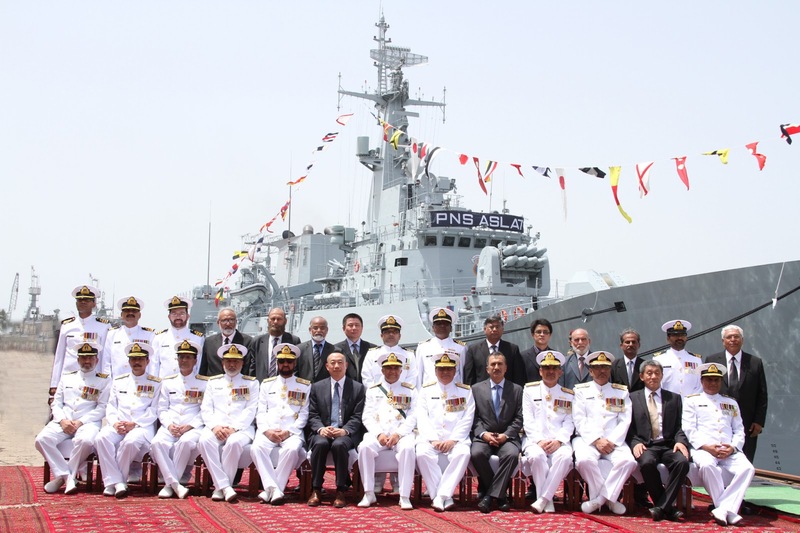 Continuing to enhance its fighting capabilities and maintain the minimum deterrence, the Pakistan Navy added the frigate being built in collaboration with China and two latest fast attack craft within a year reported. PM Sharif participated in induction ceremony of ‘PNS Aslat’, the F-22P, a multi-mission conventionally-powered frigate, is being built at Pakistan Shipyard. The frigate was built under the deal with China, the PNS Aslat (the name of sword), is added in Pakistan Navy today during presence of Nawaz Sharif. Addressing to the prestigious ceremony, PM Nawaz Sharif said that ‘PNS Aslat’ frigate’s completion on time is a milestone and thankful for China for its cooperation. Sharif said that Pakistan and China are proven friend while several other projects are in progress with China’s cooperation. He said that Pakistan Navy resulted best on each time in very short period of time and resources while induction of the PNS Aslat is a pride for us. It should be mentioned that the deal between China and Pakistan involved four F-22P frigates, six Harbin Z-9EC helicopters (already delivered to Pakistan Navy) and ammunition for the frigates. The first of the frigates, PNS Zulifqar, was delivered in September 2009, second PNS Shamsheer in 2010 and the third PNS Saif was handed over to Pakistan Navy in February 2011, reports said. An official of the 18th Destroyer Squadron said that Pakistan Navy with the available strength was fully capable of defending the country’s coastal line effectively. 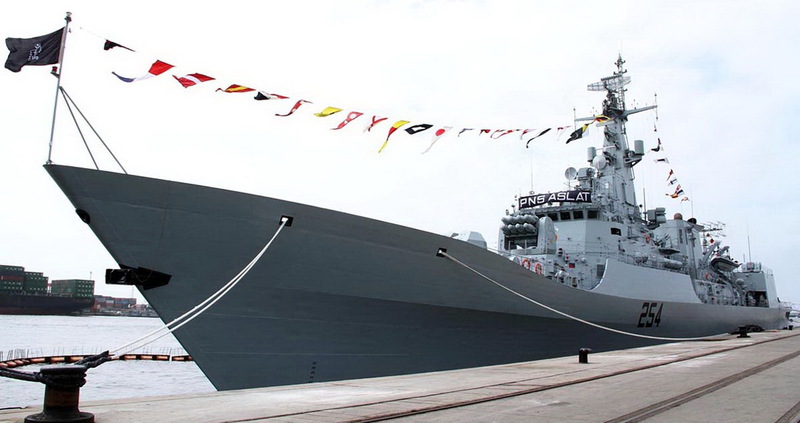 Pakistan Navy ought to get around 4-6 Type 054As from China under foreign military aid. Strengthen the frigate fleet to around 8-12 ships and then possibly negotiate for 4-6 Type 052Cs. 16-18 strong destroyer-frigate fleet with around 8/10 submarines, would allow Pakistan Navy to atleast deny then enemy from attempting to put a blockade in our Arabian Sea! You'll also need a decent naval aviation (shore base to get start) to provide air cover and datalink for the fleet. Start with the 4-6 Type 054A's. At this stage there is no way for PN to get 052C. It is too large and too expensive. Stick with the 054A and then add subs and Azmat class FAC. On a side note...what would be the possibility of replacing 4 of Azmat's missiles with 4 HQ-9s in a box. If linked to the long range radars of the 054A or an AWAC, this could be a decent stop gap for a long range Air coverage. I thought the same why Pakistan is not buying or building Air defence missile boats ! Azmat is a 600 tonne class boat, HQ-9 or HHQ-9 (naval version of HQ-9) is too big to fit as VLS. Besides, HHQ-9 needs APAR (type 346 or 346A) to work as a team. I think 054A is a logical choice if PN want a potent fleet AD capacity. 054A will work well with F-22P providing multi-layers of hard kill for any AShCM. Good post. Pakistan has literally made a big jump with the building of this frigate on home soil. The logical thing now will be to move to the 054A. Edited by Magnus, 11 May 2014 - 12:23 PM.